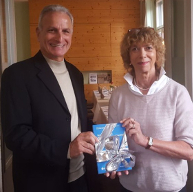 On the occasion of her birthday, ICSSPE President Uri Schaefer presented a Festschrift to Honorary President Gudrun Doll-Tepper, entitled Passionately Inclusive: Towards Participation and Friendship in Sport. The publication, structured into two sections which are headed Life and Legacy as well as Changes and Challenges, focusses primarily on globally growing participation opportunities in physical activity, physical education and sport for girls and women as well as for persons with a disability. In addition, it comprises a selection of articles which present a variety of research findings and observations in fields of activities Gudrun Doll-Tepper is identified with. Contributing authors are colleagues and friends of her, many of them well-known leaders in sport, research, as well as policy development who provide a very personal view on developments over the past decades. The publication, written partly in English, partly in German, was presented in the presence of editors, a group of contributing authors, ICSSPE Vice President Maria Dinold and the Executive Office Team. The publication is a joint initiative of ICSSPE and the German Olympic Sports Confederation.